Da da da da da Bat-girl! Yeah, Batgirl's costume is pretty epically awesome in and of itself. But when you add a tutu... well, then it's just downright terrific! If you've got a little one who's ready to step up and become the next Barbara Gordon, then it's her time. As long as you get her this girl's deluxe Batgirl costume! She'll be ready to cruise the streets of Gotham City, and give any bad guy a good firm kick or punch to let them know that their villainous ways are about to come to an end. Or, if maybe that's just a little too much action for her, she can just have a super sweet superhero soiree in her back yard. That sounds like fun too! As a dress costume with cape, mask, and gauntlets, this costume has everything she needs to become a little Gotham crimefighter. 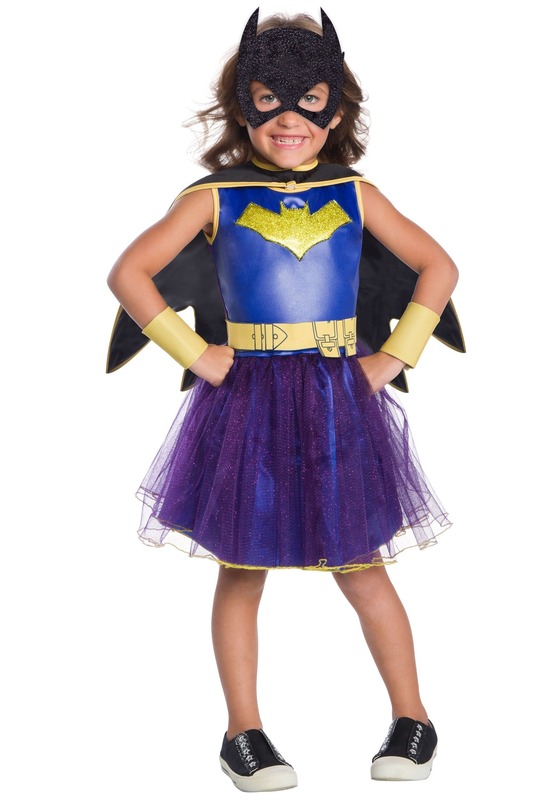 Glitter details on the mask, bat logo, and on the elegant tulle skirt will give any girl the glam to become an extra super superhero. This costume is DC Comics officially licensed, and is totally ready for her next party or costume get-together.